AMAZING food and presentations at the Sysco Foods Grand Tasting & Bartenders Bubbly Bash. Every restaurant brought their “A” game and it was obvious in every bite. You really had to be there to appreciate all of it. The upstairs Bartenders Bubbly Bash was a big hit again this year raising exactly $1,290.30 (yes people even emptied the change out of their pockets to vote for their favorites!) for the Beach Food Pantry. Lucky 12 Tavern and their bartender Glenn took it home again for the second year in a row with their delicious champagne cocktail and a whopping $347.30 in cash tips. A little about the judges panel to note. We had 6 Judges this year, with 3 of them being Chefs. The Chefs award is the highest scored dishes JUST from those 3 Chefs. 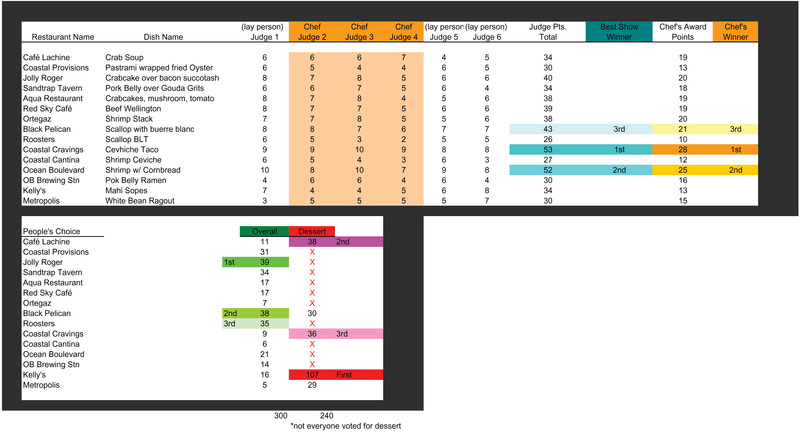 The overall Judges Awards come from the highest scoring dishes from all 6 Judges collectively. And without further delay….here are the winners of the 8th Annual TOB’y Awards. Here is the full tasting card so you can see what dished were served. The names have been abbreviated for space….we’ll say it again, you really had to be there to appreciate this offering of food….and drink!